A key activity of the conservation project is initial archaeology. This will identify, examine and build upon the published results of previous archaeology. To determine the archaeological potential of the site. Nave : Identify the location of key features including the location of columns, the western wall of the church, burial sites and side-chapels. Nave Identify the location of the great western entrance. The Rudge excavations (in previous archaeology) identified “the supposed site of the west entrance” as its actual situation could not be ascertained. 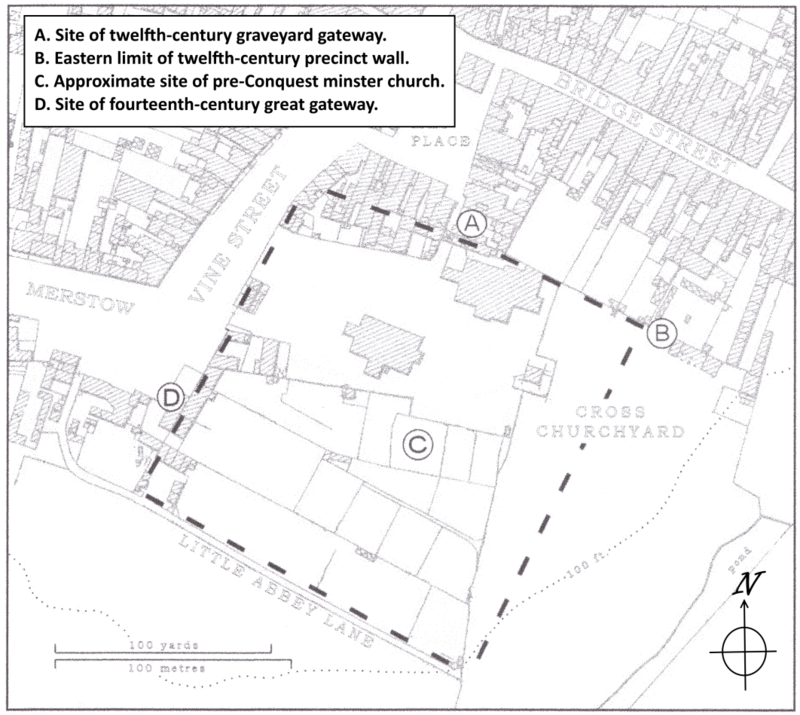 Cloisters Identify the location of the “great wash place in the cloister” (lavatorium). Cloisters Determine the size, scale and features of the cloisters. 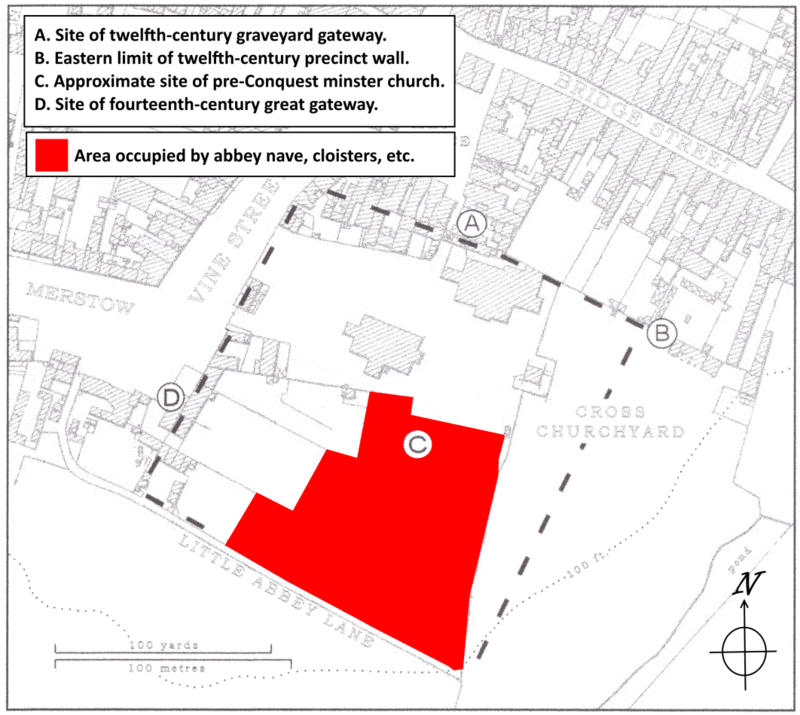 Abbey site Identify the location, size and probable function of structures on the south and west of the cloisters. These areas have not be subject to any detailed archaeological investigation; and were largely ignored in previous archaeology. This list is not intended to be comprehensive but is, instead, a list of research questions identified to date. Further questions are likely to be identified during the desk-based assessment and archive research. 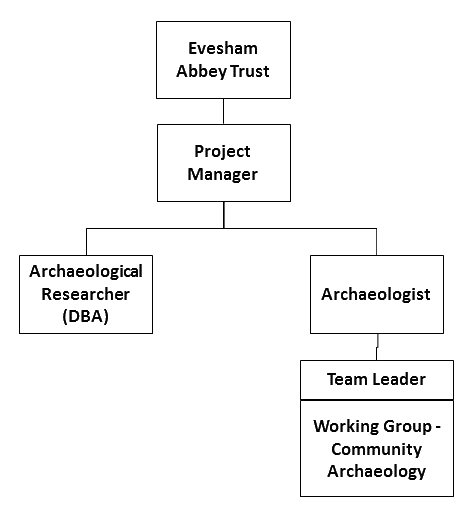 This activity, through detailed surveys and assessment, will mean that the site of Evesham Abbey will be better understood, the details and layout of the site better identified, and key aspects and features better recorded. The results of the initial archaeology will be shared through a series of tasks detailed with the engagement activity. Field walking and geo-phys surveys. The abbey site is within a scheduled ancient monument so Scheduled Monument Consent (SMC) will be required. This will involve the close examination of archive materials and documentation, including the results of previous archaeology. Details of some of these excavations are held by the Vale of Evesham Historical Society (who undertook archaeological digs in the 1970s and earlier) while other information will be held in various archives including the Hive at Worcester. These materials will help identify features and structures which might then be located on the ground through archaeological surveys. Work on the abbey was recently published by David Cox (one or our patrons) in the article ‘Evesham Abbey – The Romanesque Church‘. This provides an excellent starting point for these researches. David Cox is an adviser to the trust. The layout and key features will be determined using non-invasive surveying techniques including field walking, photographic recording, and geophys. The results of previous survey work is available for consultation; including the results of Light Detection And Ranging (LiDAR). This work is available from the Archaeology and Archive Service of Worcestershire County Council. It might also be possible to undertake “test pits” on selected areas to better understand features identified during this survey work. D.C. Cox, ‘Evesham Abbey: The Romanesque Church’, Journal of the British Archaeological Association (JBAA), vol. 163 (2010), p.49 and p.55 (pp.24-71). D.C. Cox (2010), ibid., p.56. D.C. Cox (2010), ibid., p.51. J. Sayers and L. Watkiss (ed. and trans. ), Thomas of Marlborough, History of the Abbey of Evesham, Oxford Medieval Texts (Oxford: Oxford University Press, 2003), p.495 (item 525). Dalwood, H., ‘Archaeological assessment of Evesham, Hereford and Worcester’, part of the Central Marches Historic Towns Survey (1996), pp.16-17.